There are many concerns with the application of the Biodiversity Offset Scheme (BOS) thresholds as prescribed in the NSW Biodiversity Conservation Act 2016 (BC Act). One concern raised by BPAD members, is that the application of Vegetation Offset requirements regarding 'minimising' impact, and the (apparent) resultant BAL Flame Zone (FZ). This unintended outcome is the result of trying to accommodate a development proposal without exceeding the given native vegetation clearing threshold, which will trigger the entry into the Biodiversity Offset Scheme (BOS). Once the BOS is triggered, a Biodiversity Development Assessment Report (BDAR) is to be compiled. The BDAR is expensive, but more so it will trigger the requirement to offset the clearing by generating ecosystem credits and species credits. These credits need to be purchased by the proponent if the project is approved and it can be a rather costly process (depending on the amount and type of offset credits generated). Firstly, it should be noted that all efforts should always be made to accommodate a proposal within existing cleared areas. Regardless, if clearing is necessary the BOS triggers need to be carefully considered before progressing. It is quite clear that there needs to be synergy and coordination between the consultants undertaking the bushfire and biodiversity assessments. There some exceptions to the above triggers which are specified in the regulations, but before these are discussed, it should be noted that the application of ‘avoid and minimise’ principle applies to the BDAR process and not when trying to work out the BOS thresholds triggers. To clarify, when determining the potential clearing, all components of the proposal need to be considered in the calculation (including APZs, effluent disposal field, access road, buildings, etc). Thus, if the sum of all the development footprint components exceeds the clearing threshold, then the BDAR is triggered. However, feedback received from BPAD members seem to indicate that some Council staff take the ‘Avoid, Minimise, Mitigate’ principles to mean that they apply across the board, not just to applications over the BOS threshold. Such interpretation seems contrary to the BC Act intent, which prescribes the implementation of an ‘avoid, minimise, and offset framework’ once the entry into the BOS is triggered. This is shown on Fig. 1, which illustrates the key reform areas. It is clear that up to the BOS entry, these principles are not a consideration. Nevertheless, it can be argued that by trying to accommodate the proposal within the already cleared portions of a site, avoidance of impacts is already being considered. 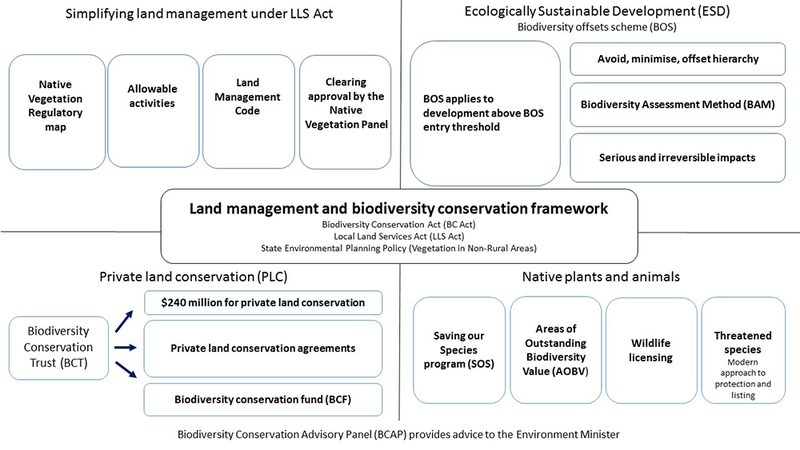 This point is further elaborated at https://www.landmanagement.nsw.gov.au/biodiversity-offsets-scheme/. Under the Biodiversity Offsets Scheme, applications for development or clearing approvals must set out how impacts on biodiversity will be avoided and minimised. For example, to avoid biodiversity impacts a proponent may change the layout of their proposed development so that less native vegetation needs to be cleared. To minimise biodiversity impacts a proponent may propose limiting certain operations during the breeding season of local threatened species, or reducing use of lighting at night to minimise impacts on nocturnal threatened species. The Biodiversity Assessment Method will be used to calculate an offset obligation (in biodiversity credits) for the remaining residual impacts, which the approval authority will consider if they approve the development or clearing proposal. (4) Despite anything to the contrary in this Part, proposed development (other than subdivision) does not exceed the biodiversity offsets scheme threshold merely because it is to be carried out on a lot included in the Map if the lot was the result of a subdivision carried out before the commencement of the Act and the lot is within land zoned R1 to R4, RU5, B1 to B8 or IN1 to IN3 under an environmental planning instrument. This suggests that zoning and history have a part to play in the BAM process, and any areas mapped purple in the biodiversity values map on a site that fits the above would not require a BDAR if vegetation needed to be removed. This is very relevant to urban lots (infill development) which may have bits of mapped rainforest or koala trees etc., which is mapped in the biodiversity values map and would trigger the BAM process regardless of clearing extent. How is clause 7.3(4) of the Biodiversity Conservation Regulation 2017 (BC Regulation) applied in determining whether the Biodiversity Offset Scheme threshold is triggered? Clause 7.3(4) of the BC Regulation provides that a proposed development (other than subdivision) does not trigger the Biodiversity Offsets Scheme due to the biodiversity values map if carried out on a lot that was the result of a subdivision carried out before the commencement of the Act within land zoned R1 to R4, RU5, B1 to B8 or IN1 to IN3. The other elements of the Biodiversity Offsets Scheme threshold must still be considered in determining whether the proposed development will trigger the Biodiversity Offsets Scheme. This clause applies in circumstances where subdivision approval has been granted on land within the nominated zones and the purpose of the approved subdivision has not yet been realised. Councils will confirm if a subdivision approval has been granted in an appropriate zone and if the purpose of the subdivision has not yet been realised. Council will also confirm that a proposed development is consistent with the purpose of the approved and unrealised subdivision. Clause 7.3(4) is not to be applied when determining whether the biodiversity values map applies under the Vegetation SEPP (Clause 4(1)). Is the Asset Protection Zone included in the area of clearing for the purposes of deciding whether the Biodiversity Offset Scheme threshold is triggered? The area of impact needs to be calculated for the whole development including asset protection zones required by the Rural Fire Service. The Rural Fire Service has guidelines on determining whether an asset protection zone is needed, what size is required, and what approvals might be required. (…). There are mounting issues re APZ prescriptions and potential triggers for BDAR. LFA staff includes Planning for Bushfire (BPAD) Accredited Level 3 Practitioner and Biodiversity Accredited Assessors. Thus LFA provides consultancy for both aspects, so the following examples are provided to illustrate the potential pitfalls. We have received request to undertake an ecological assessment for a dwelling on a partly vegetated largish rural lot. We were contacted because the council in question issued a ‘stop the clock’ order as the application had not addressed the biodiversity legislation as some clearing is required. Council correctly noted that in determining whether the thresholds for a full BDAR had been triggered all clearing needs to be accounted for including APZ, property access, onsite effluent disposal areas, etc. Clearly, the proponent here had not reviewed and accounted for the prescriptions of the Bushfire Assessment and Onsite Effluent Management Assessment. In order for us to determine the clearing extent (and thus deciding whether a test of significance only or BDAR needs to be undertaken) we asked for copy of relevant reports including the bushfire assessment. The clearing threshold for this site is 1ha. Notably the proponent was not aware of what an APZ is so their plans did not show any impact on the vegetation. LFA reviewed the BPAD Level 3 report. The report recommended certain APZ distances (based on Method 2 by manipulating fuel loads). Accordingly, we asked the proponent to include the APZs on they plans and calculate the correct clearing impact. However, the BPAD assessor not only prescribed the minimum APZ calculated, but also stated that ‘The entire lot shall be managed as an APZ in perpetuity’. As soon as someone states that the whole site is to be managed as an APZ, the calculation of potential impact needs to include all the vegetation on the site. In this case the site is 2.486 ha, even accounting for about 40% of the site already cleared; it is clear that the bushfire consultant has suddenly locked in the need to undertake a costly BDAR by simply stating that the whole site is to be managed as an APZ. In the end the BPAD Level 3 report was modified to remove this sentence, and simply prescribe the calculated APZs. Apart for accidently triggering a BDAR, we found that OEH are taking an interesting interpretation of what an APZ or IPA is. For instance we received feedback from OEH on a BDAR we have undertaken for another site, where OEH has requested that we account for disturbance of vegetation that will be retained because the RFS have told them that the whole site will conditioned to be managed as an IPA. We responded noting that the vegetation retained consists of few trees (not in proximity of hazard) that are already managed as an IPA (it is a portion of a maintained Golf Course). OEH then responded by saying, that since regeneration cannot occur in the IPA area, then we need to account for that impact. Note that means calculating costly offsets for a non-existent impact, since no regeneration is occurring already given it is currently a Golf Course. The application of the BC Act provisions should not result in increased risk to human life by pushing proposals into Flame Zone. Such outcome is perverse and should be avoided particularly for infill development (it should not be acceptable for 100B proposals). FPAA may want to consider highlighting this issue to OEH (NSW Office of Environment and Heritage), RFS and (possibly) DPE (Department of Planning and Environment). There are ways to avoid pushing infill development proposals into Flame Zone, for instance, checking the zoning, the applicable clearing thresholds and modifying the proposed development layout so that less native vegetation needs to be cleared (and thus falls below the area clearing threshold). There need to be close cooperation with other disciplines (eg. ecologist) when submitting a development application (both for infill and 100B proposals). BPAD practitioners need to be very mindful of the biodiversity impacts as triggering a BDAR and associated offset credits liability are expensive (but likely unavoidable in most subdivision proposals). On the other hand, reducing impacts to the extent that, in the case of infill development, the dwelling is pushed to BAL FZ is not a desirable outcome. BPAD practitioners also need to be very careful and clear when prescribing APZs, statements such as ‘the whole site is to manage as an APZ’ (when that would exceed the prescribed APZ distances) are to be avoided (as they could trigger the entry into the BOS). Similarly, the RFS are to be mindful when issuing advice which recommends that a whole site will be conditioned to be managed as an IPA. OEH has already indicated that that since regeneration cannot occur in an IPA area, then that impact needs to be accounted for (thus unnecessarily increasing the offset credits liability). Environmental Compliance & Monitoring - Why does it matter?